At a conference in Montana a couple of weeks ago, I gave a speech called “Fitting It All In”. 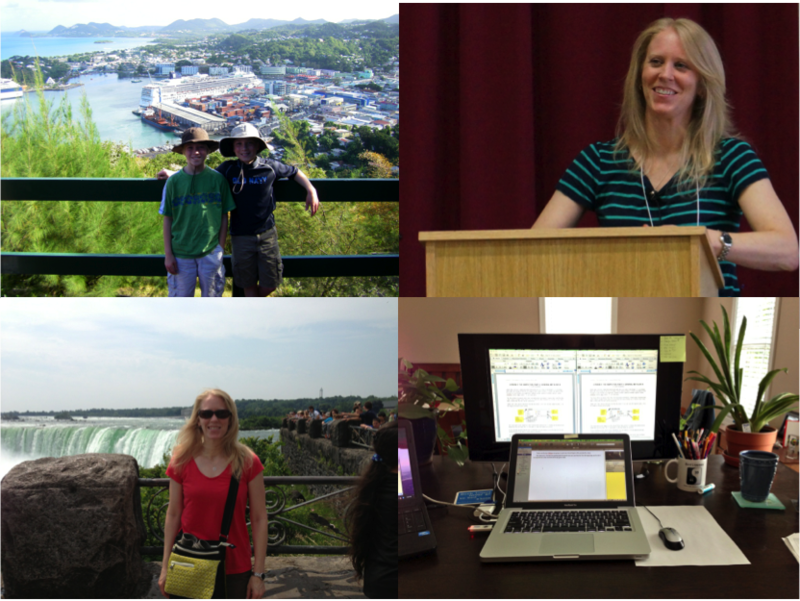 It was about how I set things up to balance being a writer, instructor, mom, and world traveler. Sometimes I do it well, other times, not so much. I talked about both. But what I love about giving speeches or writing blog posts on a topic like goals is that it helps remind me of what’s worked in the past, and what I’m not doing now that I should be. Since returning from that conference, I’ve intensified my efforts to align my daily activities with what’s really important to me. That means setting aside time to work on the things that matter most, but are often left undone. Like writing. It means finding the discipline to limit my social media, email, and other distractions. It also means setting daily targets so that when I reach them, I can move on to another task without guilt or danger of burning myself out. So far it’s working. When I get the urge to play hooky or procrastinate, I remind myself that I’ve chosen this work as my job and that I have goals (ones I really care about) that won’t be met if I slack off. I ask myself how I’ll feel about it later if I don’t do it now. Once I sit down to start, it’s a cinch. That first step really is the hardest. For tasks like writing, I find it helps to work early in the day when my mind is fresh. That way, even if I get distracted later, I’ve already accomplished my main goals for the day. And I can always find the energy to read email or post on Facebook. The same cannot be said for writing, editing, or creating class lessons. I’ve even gone so far as setting “office hours”—which can change from day-to-day depending on what’s going on with my family or my non-work schedule—to help me stay focused. An unexpected side effect of working from home is that I feel like I’m always on, always at work. I can’t just leave at five and leave it all behind. By setting work hours, I have an endpoint to my day, a specific time to look forward to. When I quit at five, if I’ve made a nice dent in my to-do list, I don’t even feel guilty about leaving my laptop closed for the rest of the night. That’s more incentive to get it all done during the day. About now, you might be wondering why I stay home to write and teach if I dislike it so much. Actually, I love it. But it’s still “work”, not just a hobby. As such, my brain views it that way. Add in all the fear of failure and rejection and low rankings that authors face, and I have to force myself to sit down if I ever want to reach my goals. But once I start, I often don’t want to stop. That is the best benefit of all. How about you? Got any tricks up your sleeve for fitting it all in? I’m experimenting with scheduling in breaks, particularly after teaching and other times when I know my brain needs a rest. There’s less guilt when it’s part of the plan! “A Clockwork Muse” by Eviatar Zerubavel is a great resource for discovering personal patterns in productivity and getting work done despite external challenges. I like to use my old-school “list of things to do”. Currently I write them on my “Reminders” iPhone app. The lists include simple and more difficult daily goals, usually about 5-10 in a day. I like the feeling of checking them off the list. At the end of the day, I have given myself evidence that I got stuff done. The items that carry over get a higher priority the next day. Ferd: I’m a big list gal myself, and work in a very similar way. I’ve been using Reminders for things with a time or date deadline, but a friend recently introduced me to another app (both smartphone and desktop) called Workflowy. It has a really simple interface that lets you make nested lists. Thanks for stopping by! Thank you, Gwen and Joyce! I’ll check out both of those apps. I’m always looking for ways to accomplish my goals and to simplify! I’ve seen and used some list apps, though, that become a project in and of themselves. Another good recommendation, Joyce. I do like the idea for my daily list of being able to clear and start over so I can see my progress without losing my entries. Thanks! I am in desperate need of time management and organization these days. And I don’t even have that much going on in my life, for goodness sake 🙂 I’m with you on the whole separation of work time and home time. Since I telecommute, I’m always home. But I’m always at work, too. When I sit down to write or blog, I’m in my office, which is where I work all day. When I first started this way of life many years ago, it was difficult to separate the two. I don’t have much of a problem with that anymore. I just need to get organized. BTW – thanks for posting all the pics. It’s great to see where you’ve been! That is so true… harder to stay organized with a lighter workload. That helps explain my day yesterday! On a different note, I’m wondering how you use Scrivener, EverNote, and Workflowy in terms of what to put where. (I’m using Scrivener for research notes/writing, Zotero for references, ShortNote for jotting down quick thoughts (simple and quick iPhone interface but lacks a lot of features of EverNote such as web syncing) and thinking about adding Workflowy and taking out ShortNote. Organizing efforts can backfire with too many apps and confusion about where to find things. Joyce: I use EverNote for more permanent collection of things. Web clippings, recipes, household information, receipts, general research, etc. I’m trying to get into Workflowy for my daily/weekly task lists. I use Scrivener for writing books, blogs, and workshops, and to collect information, notes, and research on those projects.